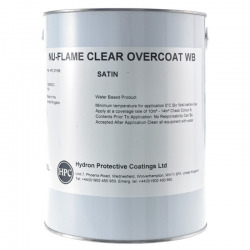 Thermoguard Fire Retardant Varnish Overcoat (Exterior) is for use in combination with and over Thermoguard Fire Varnish Basecoat in external applications. 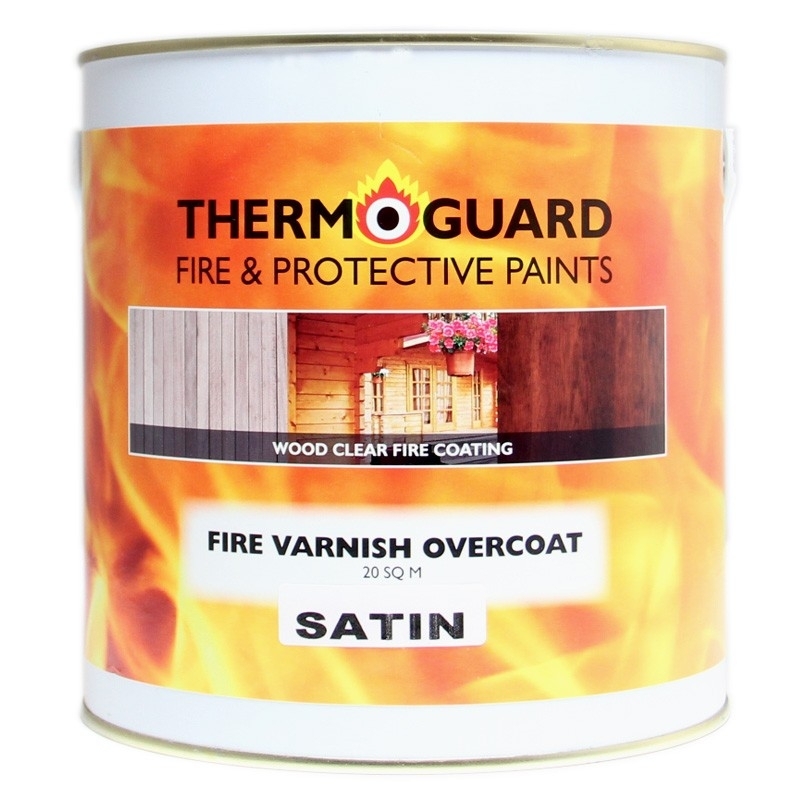 Thermoguard Fire Varnish is a clear varnish system for the Fire Protection of timber and timber derived substrates to BS Class 1 and Class 0 Surface Spread of Flame as well as BS EN Class B s2 d0 (For 30 or 60 minutes Fire Resistance see Thermoguard Fire Varnish 30 & 60 Minute System). The system is made up of a basecoat and an overcoat that must be used together, the special formula provides a tough, durable finish to external wood (for interior surfaces see Thermoguard Fire Varnish Overcoat (Interior)). The clear finish enhances the natural beauty of the wood while providing protection against UV and wear as well as fire protecting new and previously varnished surfaces. The Thermoguard Fire Varnish System is made up of Thermoguard Fire Varnish Basecoat which is a clear, intumescent varnish to be finished with Thermoguard Fire Varnish Overcoat (Interior) or Thermoguard Fire Varnish Overcoat (Exterior) available in a clear matt or satin finish (a gloss finish is available in both interior and exterior versions in batch quantities for large projects). 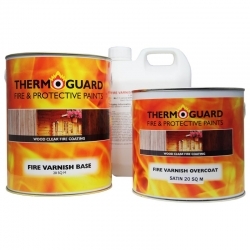 The Thermoguard Fire Varnish Overcoats provide protection against UV, weathering (exterior grade) and wear whilst Thermoguard Fire Varnish Basecoat provides the Fire Protection. When exposed to fire, the Thermoguard Fire Varnish System expands to create an insulating barrier, protecting timber surfaces from flames, heat and oxygen and suppressing emission of deadly smoke & gasses. Applicators should also refer to instructions on product containers. 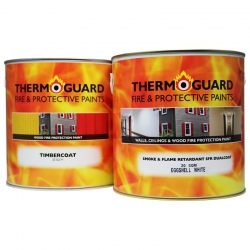 The Thermoguard Fire Varnish System can be applied over firmly adhered standard clear varnish. For existing stained varnishes, stain coatings, old fire coatings or if in doubt, contact our Technical Department on 0113 2455450. If preservatives are required, use rapid drying clear non waterrepellent grades**. For tanalised or other preservative treatments, contact our Technical Department. **Allow adequate time for stain or preservative fluids to escape before applying the Thermoguard Fire Varnish System. 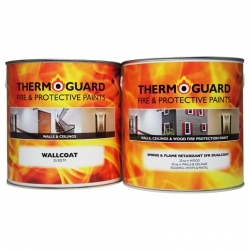 Note - For 30 or 60 mins Fire Resistance see Thermoguard Fire Varnish 30 & 60 Minute System. We will issue a Certificate of Supply upon request for each correctly specified project for Insurance, Fire and Building Control Authority and Client Records against proof of purchase. The new fire standard BS EN test lasts 20 mins. with airflow replaces the old BS 476 tests which lasted 10 mins and restricted airflow. Good morning. Can your clear varnish 2 coat system work on plywood that has been painted with acrylic paint (various colours) and still be classed as fire retardant? 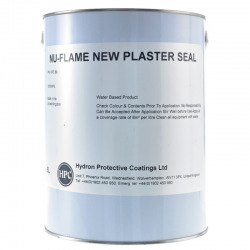 No, clear fire retardant systems can't be applied over previously painted surfaces. 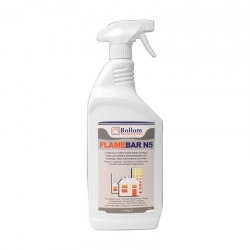 Certain clear fire retardant systems can be applied over existing stains and varnishes but not opaque paints. To upgrade previously painted surfaces you should use something like Thermoguard Timbercoat BS Class 1/0 & EN Class B System or Thermoguard Timbercoat 30 & 60 Minute System in the colour and finish of your choice. 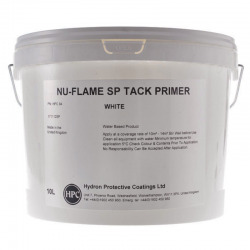 Nu-Flame SP Tack Primer is a smooth primer for glazed and previously painted surfaces used as part of the Nu-Flame Fire Upgrade System. Advantages White primer. Excellent adhesion. Water soluble. 14m²/Litre coverage. 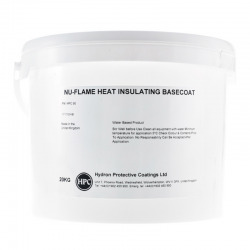 Nu-Flame Heat Insulating Basecoat is designed to insulate flammable paint systems and control surface spread of flame and fire propagation. Advantages Undercoat for the Nu-Flame System. Intumescent coating. Insulates from heat and oxygen. 12-month shelf life.